"Celebrating the Men in Our Lives"
Sanctuary is featuring male artists for this special issue. Please click on their photos to view their work. 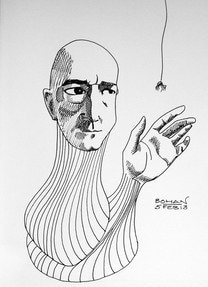 Robert Bohan is both an artist and scientist from Dublin, Ireland. Working in a variety of media, especially pen & ink, his work is emotionally autobiographical and draws strongly on the subconscious as well as his experience of science and nature. His work is part of private collections in Ireland, the United Kingdom, Continental Europe, the United States and Canada. 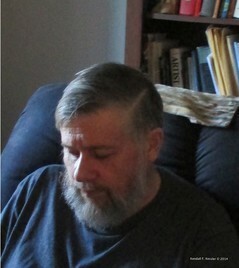 Clyde Kessler is a poet and naturalist who lives in Radford, VA. His poems have been published in many magazines, including Now & Then: The Appalachian Magazine, Virginia Literary Journal, Juked, Mad Swirl and Mud Season Review. His latest book of poems Fiddling at Midnight's Farmhouse (Cedar Creek Publishing) was illustrated by his wife, Kendall Kessler, Sanctuary's September 2016 featured artist. Gordon Bruce is an oil painter from Aberdeen, Scotland. He studied fine art at Gray's School of Art at Robert Gordon University in Aberdeen. 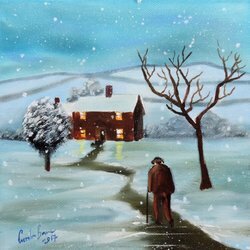 He is known for his whimsical oil paintings of cows and sheep as well as his rainy street scenes and snowy landscapes. Gordon is inspired by his surrounding countryside. 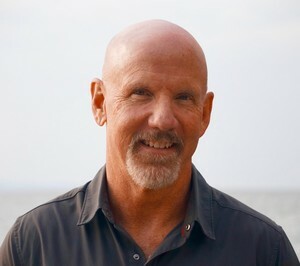 Jon Ososki is an electronic music artist, multi-instrumentalist and composer from Fairfield County, Connecticut. 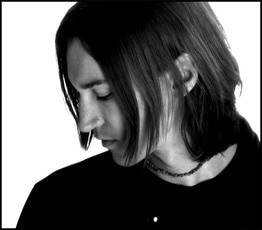 Jon writes music for documentaries and short films. Recently, he composed music for two independent short films written and directed by women. He is also a strong supporter of the arts in his community. received numerous awards for his writing. His latest novel Beneath a Scarlet Sky is based on a true story about an unlikely hero who saved countless lives in WWII.